A couple of eportfolio developments that have come up over the last week or so that may be of interest to readers. The first is the Digication ePortfolio Google Apps addon posted by Helen Barrett on the K12 ePortfolio Google Group. This is a very exciting development. The combination of GoogleDocs/Sites for collection/integration of technology into the curriculum, Blogger for day-to-day reflection/documentation of learning, and now Digication for presentaton/reflection/showcase makes GoogleApps Education Edition the strongest platform for K-12 schools to implement e-portfolios. While the videos above show how easy it is to set-up and construct your Digication eportfolio, it is not clear how a teacher, mentor, coach or another student is able to participate in the learning process of the eportfolio and provide feedback and comments. Even if this option only caters for the presentation/showcasing element of an eportfolio, I still think commenting and feedback has a place. What it is reinforcing is the increasing potential of Google Apps in your school to be the central portal to your learning and school administration spaces, especially as more and more education solutions are added to the marketplace. MyPortfolio is an eportfolio tool provided to New Zealand schools built on the Mahara eportfolio platform. In a recent press release, it has been announced that this service will continue to be provided free to schools until the end of 2013. This is great news and reinforces the Ministry of Education’s continued support of eportfolios for teachers and students in NZ schools. Not only is the service confirmed as being free, it has also been updated to include a wide range of new features and improvements. More information on these enhancements can be read in this document but for me the most interesting development is in the new Moderation Online tool. 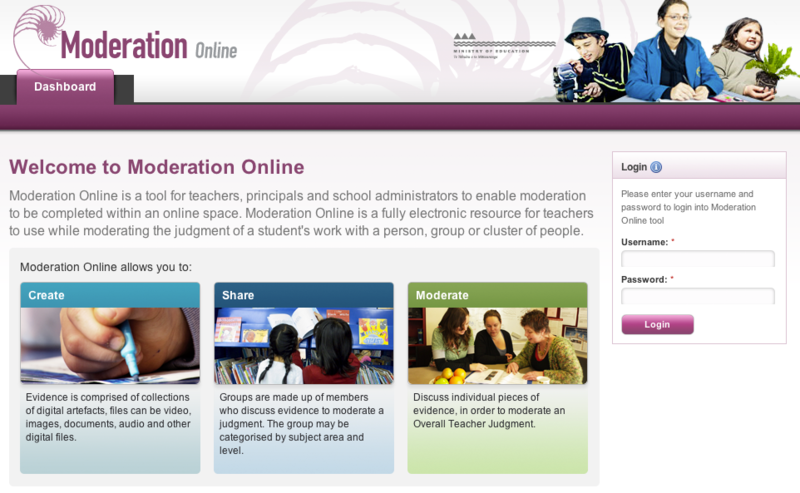 I think online moderation has huge potential for teaching and learning, if not just to get teachers collaborating and participating online unpacking and reflecting on learning. I see it as having such a close relationship if not being integral to a teacher’s professional eportfolio. I have yet to have a play with this new functionality but thanks to Paul Seiler at the MOE, I am all set up and ready to see how it works. More to come on this. If you are interested in finding out more about digital portfolios then these guidelines will increase your understanding of the emerging importance and place of ePortfolios in the education of our children. The guidelines are aimed primarily at, but not limited to, a non-technical audience with limited prior knowledge of ePortfolios. If you are a school leader, then the guidelines should provide you with sufficient understanding to enable you to consider the place of ePortfolios in your school’s ongoing educational strategy.